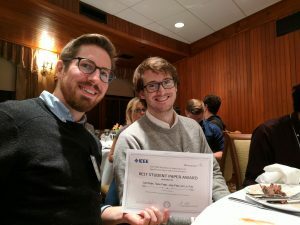 UW Electrical Engineering (UW EE) Ph.D. student Thomas Powers and UW EE alum Scott Wisdom (Ph.D. ’17) received the Best Student Paper Award at the IEEE Workshop on Applications of Signal Processing to Audio and Acoustics in New Paltz, New York on October 15. Their paper “Deep Recurrent NMF for Speech Separation by Unfolding Iterative Thresholding” investigates a new type of recurrent neural network architecture for speech separation. Speech separation is the separation of a desired speech signal from a mix of environmental signals. An example of this would be to identify someone talking, while being surrounded by other ambient noises at a restaurant (i.e. clanging dishes, orders being taken, etc.). Advancing speech separation techniques can improve automatic speaker recognition systems and aid in the development of hearing aids and cochlear implants where noise reduction is essential for speech intelligibility. The authors’ proposed architecture, deep recurrent NMF (DR-NMF), provides several improvements on current speech separation systems, including better interpretability, faster test time and stronger generalization and separation. Powers’ advisor is UW EE Professor Les Atlas, with joint advising by Drs. Jim Pitton and David Krout of UW’s Applied Physics Laboratory. Prof. Atlas also advised Wisdom, who now works at Affectiva in Boston. Congratulations to Thomas and Scott!